Marston would like to thank Dennis Brew, Donald Hodgman, Peter Lack, and Andreas Schmauder for their help in producing this issue. Little is known about Pyotr Slovtsov. He was born in Ustianskoye, Siberia, and his vocal talents were discovered early. He studied with Ivanov-Radkevich, a noted composer and teacher. 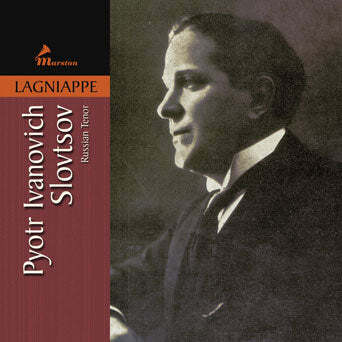 Slovtsov attended the Warsaw University law school (1909) and subsequently entered the Moscow Conservatory under I.Y. Gordi. He made his operatic debut with the Kiev Opera in 1912, and sang there until 1915, when he joined the Petrograd People’s House Theatre and appeared alongside Chaliapin. His repertoire included Faust, Rusalka, and Prince Igor. In 1920 he and his wife, the singer M.N Rioli-Slovtsova moved to Krasnoyarsk where they taught and sang together. In 1928 he was appointed professor of music at the Moscow Conservatory, but continued his career appearing at the Bolshoi in a wide variety of popular roles. He was heard as a guest in a number of regional houses and at the Mariinsky and was active until his early death in 1934 at the age of 48. Slovtsov’s records are extremely rare and sought-after by a small number of collectors; even in the 78 world, Slovtsov is not a household name! Yet, reviews of the time place him on firm footing with Alchevsky, Davidov, Vitting, and Labinsky, and possibly Sobinov, Smirnov, and Figner.